[from my article in the Middle East Times weekly, based in Cyprus. Along the 100-kilometre dirt road through the wild gorges of the Shyok and Indus rivers from Khaplu to Skardu in Baltistan one cannot help feeling that the enormous bleak rock faces, the jagged, snow-covered peaks poking into the clouds, the eerily frozen waterfalls, the huge boulders strewn all around and the vast scree slopes must belong to some distant uninhabitable planet but not to this earth. All of this spells danger. Under a gloomy, leaden sky, with the sun’s rays unable to break through thick clouds that hide the high mountain tops, there appears to be a veiled threat of impending disaster. For four days from the end of 1987 until the first day of 1988 heavy clouds hung above Skardu Valley and hid the many 5,000-metre mountain peaks surrounding it on all sides. As the small airport in the valley had no radar, all flights were cancelled. The sky looked as though there was worse weather to come, so it seemed that there was no choice but to court disaster and take the bus. Everyone in the packed, gaily-painted bus appeared to be in good mood when the journey began on the first day of the new year. 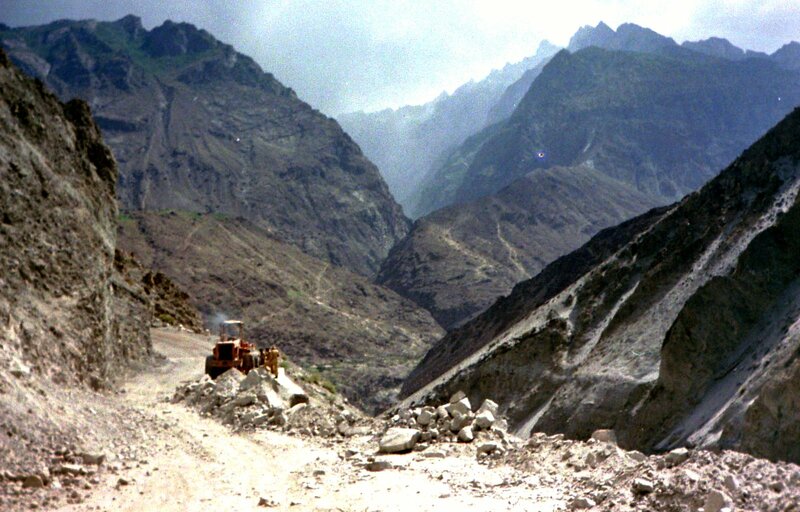 The gloomy atmosphere outside did not affect the passengers for a long time as the bus sped on the asphalt road to the western end of the valley, then moved slowly over a narrow suspension bridge across the Indus and entered the gorge. Compared with the bleakness of the grey, brown and black tones of the massive rock formations on its sides, the river was a pleasant sparkling green colour — almost inviting save for the fact that it was at times separated from the road by several hundred metres of sheer cliffs [I had already traveled the Karakoram Highway from Skardu to Gilgit and Passu in Hunza, and down to Rawalpindi 2 years earlier in August 1985 — but in summer the Indus is a dirty brownish color; quite different from its look in winter]. A military officer ran up on the road from behind the bus and knocked on the driver’s side window. The two exchanged some angry words. The driver had been ordered to pull the bus up to the edge of the precipice to allow a military truck to pass. He did so but complained bitterly. Then the officer also ordered the bulldozer to get out of the way at the next spot where this was possible. The military truck sped on ahead, followed quickly by the bus, whose driver appeared very angry and nervous all of a sudden. He was determined to pass the military truck, which was already moving quite fast on this perilous road with rock walls or scree slopes to the right and a gaping black chasm to the left where in many places parts of the asphalt had broken off and plunged down into the gorge. The bus driver used his ear-shattering horn and flashed his lights wildly to drive his message home to the soldiers. Suddenly, there was another bus in front and the angry driver of the first bus flashed his lights to signal that he wanted to pass. The bus in front slowed down but stayed in the middle of the road for some time. When it finally allowed the first bus to pass its driver was fuming. To make matters still worse, the other bus also stayed close behind and flashed its lights. Many passengers on the first bus were terrified but no one dared to approach the driver for fear of distracting him in this extremely dangerous situation. After what appeared to be an eternity, the valley widened and the bus stopped at a petrol station. When the bus left the station after refuelling, a teenage boy sat down on an improvised seat next to the driver and this seemed to calm the man down. Later, he let the boy drive the rest of the way to Gilgit. Although the boy’s driving was somewhat unsteady from lack of experience, the passengers were relieved that the bus was now moving more slowly and carefully.